We’d love your help. Let us know what’s wrong with this preview of Undying by Amie Kaufman. Trapped aboard the Undying's ancient spaceship and reeling from what they've learned there, scavenger Mia and academic Jules are plunged into a desperate race to warn their home planet of the danger humanity's greed has unleashed. From the mountains of Spain to the streets of Prague, the sequel to Unearthed is a white-knuckle ride that will send readers hurtling back to ea Trapped aboard the Undying's ancient spaceship and reeling from what they've learned there, scavenger Mia and academic Jules are plunged into a desperate race to warn their home planet of the danger humanity's greed has unleashed. From the mountains of Spain to the streets of Prague, the sequel to Unearthed is a white-knuckle ride that will send readers hurtling back to earth, and leave them breathless until the last page. To ask other readers questions about Undying, please sign up. Jenna Kathleen wrote: "Sorry you were,disappointed." The disappointing books make the good ones that much better! See that pile of disappointment over there? Yeah, that's me. I don't know why the authors decided to go this way for this book but it was all so...meh. The first book, Unearthed is really "Indiana Jones in space" with exploring, temples, artifacts, traps etc. This book is "angsty teens go on a trip across Europe because they are The Only Ones Who Can Save Earth™ ". It's a completely different book/theme than the first one. I'm gonna keep this review short because honestly, I don't have the will t See that pile of disappointment over there? Yeah, that's me. I'm gonna keep this review short because honestly, I don't have the will to construct sentences and I don't have time to explain everything that was bad with this. After the bombshell of the ending of Unearthed, and all the resulting questions, there was no doubt that I was going to read this second and last instalment. Once more the narrative is divided between Jules and Mia, this time trying to save Earth from the Undying’s invasion. Although I really enjoyed all the puzzles in the first book, as well as our main two protagonists, I felt this novel was better, even with the few obvious aspects. Yes, it is ‘younger’ in tone than Illuminae and not as brilli After the bombshell of the ending of Unearthed, and all the resulting questions, there was no doubt that I was going to read this second and last instalment. Love the cover! Serious sci-fi feels and still on the theme with the previous cover. This is the consistency I need. Okay, so I tried to find this book on Amazon and Bookdepository but nothing came up. Tried to check Amie's website and it just says this book will be out 2018. Like, I need more concrete news on this! I literally just finished Unearthed and I need this sequel now! I did not realize it was a duology, but at least I know the story won't drag on. I actually liked this conclusion to Unearthed better than the first book. Sure the explanations involved a bit of hand-wavium, but the story was pretty good and overall I enjoyed it. Undying is part two of the Unearthed duology, and finishes the series in epic style. Yes, this is YA, so there's a certain amount of making googly eyes while the world burns going on. But it's handled better than in many series, and even called out by one of the new characters we get to meet, so I'll forgive it. And definite bonus points for not trying to stretch this into a trilogy. I did miss the archaeology and the puzzles from the first book - that was a lot of what really ticked my boxes whe Undying is part two of the Unearthed duology, and finishes the series in epic style. I did miss the archaeology and the puzzles from the first book - that was a lot of what really ticked my boxes when reading it. This time around, we're on the Undying spaceship, and the archaeology is completely set aside. However, it's still one of the smartest pieces of YA fiction I've read - I may not read much of it any more, but in the early 2010's I was reading all I could get - and I'd happily see my children read this. The overall message is one more adults could use, let alone our youth, most of whom seem to get it already. Love the cover! Way better than the first one, but still consistent with the theme. THEY RECAPPED BOOK 1 AT THE START BLESS THANK YOU SO MUCH I LITERALLY FORGOT EVERYTHING THAT HAD HAPPENED ILYSM!!!!!!!!!!!!!!!!! And the rest of the book was also AMAAAAAAAAAAZING!!!! But srsly, what a ship!!! I just felt like it was missing something?? Idk why exactly this didn THEY RECAPPED BOOK 1 AT THE START BLESS THANK YOU SO MUCH I LITERALLY FORGOT EVERYTHING THAT HAD HAPPENED ILYSM!!!!!!!!!!!!!!!!! I mean there were a lot, but that one was just underwhelming. This review originally appears on Happy Indulgence Books! Check it out for more reviews. I really enjoyed the sequel to Unearthed, especially seeing what lies in the fate of Jules and Mia at the end of the last book. It was interesting seeing them come back to Earth and navigate the competing agendas of the Undying and the politics on Earth. There's definitely a lot less romance here, I still liked Jules and Mia together (and also separately) and there was also a sense of urgency like from the fi This review originally appears on Happy Indulgence Books! Check it out for more reviews. I really enjoyed the sequel to Unearthed, especially seeing what lies in the fate of Jules and Mia at the end of the last book. It was interesting seeing them come back to Earth and navigate the competing agendas of the Undying and the politics on Earth. There's definitely a lot less romance here, I still liked Jules and Mia together (and also separately) and there was also a sense of urgency like from the first book. It was kind of missing the excitement and novelty of the first book with solving all the alien messages though, and everything kind of felt ho hum with a pleasant ending to the duology. Undying is a spectacular sequel. 3.5 stars. I loved this series , but I think the first book was a lot better than its conclusion. It felt like everything went too fast and the conclusion felt simple and rushed . It had a lot of promise with the premise of it all. While I still liked the ending I kind of feel like it could have been so much better! . Oh well , looking forward to what both of its authors come up with in the near future. I received a copy from the publisher in exchange for an honest review! While I still loved Undying, it was just missing a tiny smidgen of the awesomeness that was Unearthed (Massive props to the quick recap at the front of Undying. That was an actual life saver!). But first, can I just say, that I didn't actually realise it was the conclusion? Or maybe I was just pretending to not notice because I didn't want another series to finish. I love love love Mia and Jules. They are so well writt 4.5 Stars! I love love love Mia and Jules. They are so well written that all I wanted to do was be closer to them. I would also 117% be okay with getting a paper cut from rubbing the book on my face if that was the way to be closest to them. They both had such vivid personalities. Seriously, they are so well formed that I could always tell whose perspective I was reading from - even if the handy chapter headers suddenly decided to disappear. Undying didn't have as much puzzle-solving as Unearthed. Which was okay because I suppose there was the more pressing issue of the human race facing it's impending doom on Earth. But I still missed it, just a teeny tiny bit. But they made up for it with all the action and turny twists and all the wonderful things you hope for in a book. Overall, I am a very satisfied potato who will miss these characters dearly. I don't know what it is about this book, but it felt very mediocre. I loved the beginning, but after that it just got repetitive, and extremely predictable. BTW they recapped the first book at the beginning which was SUCH a good idea. Every sequel should do this! At this point, it's just my own fault that I have to wait till 2019. Tbh I should just wait until the whole series is released. I should DEFINITELY not read books right after they are released. It j I don't know what it is about this book, but it felt very mediocre. I loved the beginning, but after that it just got repetitive, and extremely predictable. At this point, it's just my own fault that I have to wait till 2019. Tbh I should just wait until the whole series is released. I should DEFINITELY not read books right after they are released. It just adds to the agony. Whaaaat???? This released already? Why did nobody tell me??? And here I have been waiting for it when I didn't even have to! 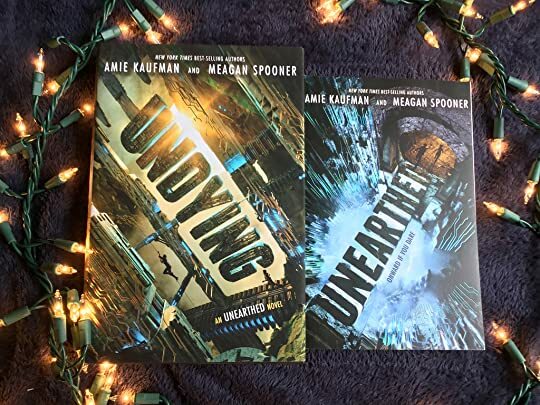 Initial Impressions 12/26/18 and review as posted on The Book Addict's Guide 1/4/19: UNEARTHED was one of my favorite books from 2018 so naturally I was dying to read UNDYING! The way UNEARTHED ended was such a killer and I couldn't wait to see what happened next! UNDYING was quite a solid progression in this series and had some great plot-building and overall concepts that continued building the series, but basically until this review was published, I didn't realize this was the last book and th Initial Impressions 12/26/18 and review as posted on The Book Addict's Guide 1/4/19: UNEARTHED was one of my favorite books from 2018 so naturally I was dying to read UNDYING! The way UNEARTHED ended was such a killer and I couldn't wait to see what happened next! I loved the space/other planet element of UNEARTHED and it was part of what made me love the book so much with the added bonus of mysterious alien elements and a treasure hunting feel. UNDYING had a much different feel for me, and it wasn't a bad thing but it didn't have that same special feel that UNEARTHED did. The more I think about it, the more noticeable it feels so that's kind of a bummer. I did still enjoy UNDYING and I liked where the series went, but it didn't feel as magical and as exciting. Mild spoiler (sorry) to say that we make it back to Earth somewhat quickly in the beginning of the book and so that space element is lost and it just wasn't as thrilling for me in that respect. The change of setting gave the book quite a different feel for me. This is where my review gets extra complicated -- The whole time I was reading this book, I was sure it was the second book in a trilogy. It just sounded and felt like it was and didn't feel like it was leading towards the end. There was so much that was left to happen and I thought this was another one of those series (*cough* Renegades *cough*) that was advertised as two books but was getting stretched into three. That's how not-a-last-book this felt. So as I was reading, I had many "second book" feelings. I was expecting a cliffhanger at the end like the crazy way we were left in UNEARTHED and I was disappointed at the lack of cliffhanger (so I guess thank goodness there wasn't one). There kiiiind of was something that happened that was supposed to be shocking but I also kind of knew it wasn't going to stick? (Another complicated non-spoilery sentence but you'll know what I mean if you've read it.) Especially me thinking it was only the second book, I just didn't feel like it was something that would be permanent so I wasn't too worried about the shocking moment. If I had known better, I would have been a bit more panicked. I also really loved that the other cliffhanger from book one was a reveal about the plot and history and we didn't have that same sort of feel here. There were a lot of reveals within the book that were cool and surprising, but they were also surrounded by action so it didn't have time for it to sink in, at least for me. 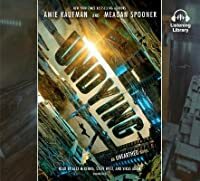 Undying is the final book in the Unearthed duology and gives us a chance to find out what happened to Mia and Jules when they were onboard the alien spaceship headed back to earth. They're the only humans alive who know that the ship is a Trojan horse bringing an army of alien invaders with it but they've got no way of letting anyone know what is going on unless they can get off the ship and back on earth soil. 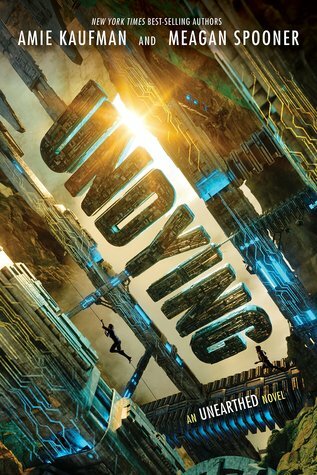 After escaping on a landing shuttle and picked up by the International Alliance you'd Undying is the final book in the Unearthed duology and gives us a chance to find out what happened to Mia and Jules when they were onboard the alien spaceship headed back to earth. They're the only humans alive who know that the ship is a Trojan horse bringing an army of alien invaders with it but they've got no way of letting anyone know what is going on unless they can get off the ship and back on earth soil. After escaping on a landing shuttle and picked up by the International Alliance you'd think it would be easy for them to explain what was happening and get some help with the situation. Unfortunately for them nobody is willing to listen to their explanation and the IA doesn't believe that the world is about to be invaded. If the IA won't listen Mia and Jules have no other option but to try and stop the Undying on their own but to do that they're going to need answers that only Jules' father has access to. I really loved the Indiana Jones feel to the first book which was all about exploring an alien temple on a far distant planet solving puzzles along the way so I have to admit I was a little bit disappointed to be back on earth for the sequel! It made perfect sense though and it was fun to see Jules and Mia thrown into a completely different situation and have to figure out how to evade the authorities long enough to get the answers they needed. Their journey across Europe was fun to follow and we also get to meet some fun new characters in this one so I enjoyed having a larger cast for this story. A satisfying conclusion to the Unearthed Duology. The story here picks up right where we left off in Unearthed and it is a fast paced race to the finish line. Mia and Jules are really great characters to read about but as much as I hated the romance in the first book, I loved it in this one. I don't know what happened or why. It seemed to really fit the story. Both Mia and Jules had some really emotional character arcs as well. Even though I did find the ending to be a little anti-climatic (and A satisfying conclusion to the Unearthed Duology. The story here picks up right where we left off in Unearthed and it is a fast paced race to the finish line. Mia and Jules are really great characters to read about but as much as I hated the romance in the first book, I loved it in this one. I don't know what happened or why. It seemed to really fit the story. Both Mia and Jules had some really emotional character arcs as well. Even though I did find the ending to be a little anti-climatic (and that is all I will say). We were introduced to a couple new characters and they each provided some good fuel for the story and plot. I don't want to say to much more because this is a sequel and a conclusion. I really enjoyed this series and I think Amie and Meagan are a really great author duo and I am truly excited for what story they decide to give us next. Second and final book of Unearthed Duology did not fail me but the first book was the best. Mia and Jules do solve the puzzles placed by Undying and that leads them to a spaceship. But intervention of IA leads the events to a different direction.But Mia and Jules along with Jules's cousin Neal are determined to save the Earth from Undying. With good narration, well build characters and world, I had a very good read. Well, that was a fun ride! Definitely an amazing conclusion to such incredible series! I’m honestly so glad I decided to pick up this duology because I absolutely LOVED it, and it most certainly became one of my new favorites! Somewhere along the way this flopped into teen romance pit and with that sugary ending accelerated my visit to dentist by 2 months. Good but could have been so much better. Gosh, I'm glad this won't be another trilogy. A perfect sequel! Jules and Mia are such incredible characters (together and apart) and I loved following them on the second half of their journey on earth. I also loved the expanded world building, secondary characters (Neal! The best! ), and ultimate explanations for the Undying. This series finale was absolutely everything I wanted it to be. A HUGE kudos for the "Recap" section at the beginning. Readers are given a quick review of the events from book 1. I really wish all authors/series would do this! This a decent follow-up, but it wasn't nearly entertaining as the first book. I longed for more space action. I adored Jules and Mia, but it seemed nothing significant happened until the closing chapters. I still adore this writing duo and will pick up their next collaboration. Not as engaging as Unearthed but still enjoyed it nonetheless. Especially the second half. Unearthed led listeners on an edge of your seat twisting sci-fi archaeological adventure that left things at a breathtaking cliffhanger for Mia and Jules. Undying begins with a nice letter from the authors that catches readers up on the world of the duology and where things are at in the story before diving back in. This is not a good place to summarize details or it will ruin some of the brilliant high points of the first book, Unearthed. I'm going to go vague and stick with impressions and obser Unearthed led listeners on an edge of your seat twisting sci-fi archaeological adventure that left things at a breathtaking cliffhanger for Mia and Jules. This is not a good place to summarize details or it will ruin some of the brilliant high points of the first book, Unearthed. I'm going to go vague and stick with impressions and observations rather than a recap. This actually works good because there are aspects of the way this one wraps up that left me not really sure what I thought about it. First of all, if you, like me, had your interest piqued by the archaeological adventure aspect with puzzles and mysteries of the first book, that is way scaled back since the focus is more on how to save earth which was already in desperate straights due to over population and not enough resources. Instead, we are brought back to earth, so to speak, with earth politics and getting everyone on board with the threat that is now come to earth. There was also a teenage romance brewing strongly in book one between all the dangerous traps and close calls that is more of partners and friends in this one. I actually liked this because I felt the focus on survival on what the pair inadvertently unleashed on earth is the better focus. I continued to like Mia and Jules separately and together. Mia is still the kickbutt action heroine and Jules more the intellectual type, but they work together well especially now that they've established trust and understanding from their earlier adventures. I enjoyed seeing the addition of some other characters in the mix to change the isolation dynamic that was present in book one. While, this one is missing the puzzles and traps and mysterious other planet quality of the first book, it is by no means dull. Rushing to save your life and the lives of everyone on earth will do that for you. If I have a niggle, it was that I wanted to slow things down a bit there at the end and tease some things out better. The narrators, Alex McKenna and Steve West who traded off the narration in the first book were consistent with that book and still fabulous, but, we added Vikas Adam to the mix. Other's have praised his work and I can see why now. They all did a great job bringing this exciting sci-fi to life and portraying the characters. I would definitely listen to more work by all three of them. All in all, I enjoyed this young adult sci-fi and can recommend it to those who want a lot of action and twists to their story headed by a pair of engaging characters. Today is a pretty big release day. I woke up to several new audiobooks and emails notifying me of incoming preorders. Exciting! But how do you pick which one to read first. Some of us have extensive spreadsheets, some of us are mood readers, and some people just want to be reminded. I finished Undying in a day after marathoning the audiobook because I was desperate to know what happens to Jules and Mia. Check out my 5 reasons why Undying is your read this release day! (Slight spoilers for Unearth Today is a pretty big release day. I woke up to several new audiobooks and emails notifying me of incoming preorders. Exciting! But how do you pick which one to read first. Some of us have extensive spreadsheets, some of us are mood readers, and some people just want to be reminded. I finished Undying in a day after marathoning the audiobook because I was desperate to know what happens to Jules and Mia. Check out my 5 reasons why Undying is your read this release day! 1. Mia and Jules. The story is told in their alternating voices and if you don’t fall in love with Mia’s charge-into-everything and Jules’ wait-lets-think-about-this banter, I don’t even know how to please you. These two are completely lovable and it’s no secret there’s some romance here. Faced with dying (and the Undying), you’ll see them grapple with their completely different upbringings and futures along with self preservation vs no person left behind. I definitely read this series for the characters. 2. The Undying. At the end of Unearthed, we are left with knowing very little about the alien race Mia and Jules are hiding from. Meg and Amie use Undying as a way to go deep into worldbuilding and create some awesome side characters. Come for the puzzles in Unearthed, stay for the gasps as Mia and Jules uncover more info about the Undying and their motivation. You will NOT see it coming. 3. The feels. Like can we ever read Amie without wanting to send her our medical bills for constantly trying to kill us? There are some pretty big O M G moments in this book and every time I thought I knew what this book was going to throw at me, I was wrong. So expect to have a lot of emotions and let’s form a therapy group after. 4. Action packed. See above, right? Mia and Jules are constantly on the run or hiding or generally just trying not to get caught but a killer alien race. This action packed story will keep you turning the page (or speeding up the audiobook) just to see what’s coming next. 5. Excellent narrators. I listened to both books and loved the dual narration. Alex McKenna has this perfect, slightly scratchy voice that I love for space books and Steve West is just universally loved for his emotive voice. Amie Kaufman is a New York Times and internationally bestselling author of young adult fiction. Her multi-award winning work is slated for publication in over 30 countries, and is in development for film and TV. Raised in Australia and occasionally Ireland, Amie has degrees in history, literature, law and conflict resolution. She lives in Melbourne with her husband, their rescue dog, and an extrem Amie Kaufman is a New York Times and internationally bestselling author of young adult fiction. Her multi-award winning work is slated for publication in over 30 countries, and is in development for film and TV. Raised in Australia and occasionally Ireland, Amie has degrees in history, literature, law and conflict resolution. She lives in Melbourne with her husband, their rescue dog, and an extremely large personal library.